Baek So Chun, the master of the Ruling Fire House. She calmly guided her surprise visitor to a seat. That visitor naturally sat down on the seat, and spoke. Gongson Chun Gi. He tucked his head and grinned. Baek So Chun brought some fruits and sweets, and opened her mouth. Baek So Chun paused a bit, then spoke. Gongson Chun Gi’s eyes got thinner. When Baek So Chun saw this, she let loose a cold sweat and bowed down. Gongson Chun Gi spoke as he began to tap his fingers restlessly. Baek So Chun sent someone to bring Gongson Ahri. A few moments later, Gongson Ahri could be seen running towards them at full speed. Gongson Chun Gi hugged his daughter who had been running at him from his seat. Gongson Ahri blushed a little, and lightly pushed Gongson Chun Gi away. Nod nod. Gongson Ahri vigorously nodded in agreement. Gongson Chun Gi bitterly smiled when he saw her daughter’s gaze full of curiosity and reverence. That was because his daughter didn’t know much about the mainland. While Gongson Ahri clapped her hands in excitement, Gongson Chun Gi stroked his daughter’s hair and spoke. Gongson Ahri jumped up in surprise, then began to send small glances at Baek So Chun. Looking at that, Gongson Chun Gi smirked and spoke up. Gongson Ahri stared at Baek So Chun wordlessly for a moment, then nodded with an apologetic face. The Ruling Fire House was a forbidden land for all men. Anyone who would step inside without permission would be killed on sight. Of course, the Pope was an exception to this rule. Gongson Ahri tried to pretend to be innocent, but in front of Gongson Chun Gi, such acts were useless. Gongson Ahri backed away more and more under the gaze of her father. When Gongson Chun Gi wouldn’t yield with his gaze, Gongson Ahri slowly looked away from her father completely. Gongson Chun Gi let out a tired sigh, which was unusual in itself, and spoke. What did he want? When Gongson Ahri let out a confused expression, Gongson Chun Gi opened his mouth yet again. This was, again, a very vague question. The situation was a little awkward to say that it was good, but then she couldn’t say it was bad, either. That’s why Gongson Ahri chose to say the safest thing she could think of at the moment. She didn’t know what her father was going for, but when this question arrived, she answered immediately. Gongson Chun Gi’s eyes brightened. When Gongson Ahri flinched, her father spoke. How should she respond? After thinking a bit, Gongson Ahri decided to respond honestly. Gongson Chun Gi grinned when he heard his daughter’s words. When Gongson Ahri made a confused face, Gongson Chun Gi stroked his daughter’s hair and spoke. Gongson Chun Gi grinned happily as he stroked his daughter’s hair. His daughter would definitely live longer than he. Gongson Chun Gi couldn’t keep taking care of her forever. But as long as his daughter had something like this, living would be much easier for her. Thinking that just made Gongson Chun Gi happy. Putting someone in an unfamiliar environment for a long time isn’t good. No matter how calm and intelligent Cho Ryu Hyang was, he was still eleven. The boy needed to be cared for. Plus, didn’t the boy lose a teacher who was considered to be like his father? The boy really needed some help. When Gongson Chun Gi thought this much, he began to feel a bit hurried. Gongson Chun Gi hugged his daughter tightly, then grinned at Baek So Chun as he spoke. Gongson Chun Gi left an afterimage as he looked at Baek So Chun bowing at him. He was moving faster than the wind itself to see his disciple. The Garden was in a mess. He felt something going on a far away, so he sneaked in silently, but to think he’d see such a thing……. For some reason, the Heaven Destroying Guardian Corps (守護滅天隊), who only existed to protect the Garden, was attacking Cho Ryu Hyang. And surprisingly, the Administrator was just watching all this from the sidelines. Gongson Chun Gi didn’t know what happened, but the situation didn’t look too good. Gongson Chun Gi thought of moving, then changed his mind, and sat down on the spot. He knew that his disciple possessed Godly Eyes that were said to be unique even among unique eyes, but he didn’t know that it could be this powerful. Gongson Chun Gi tucked his chin in his fist, and watched the battlefield with interest. The boys at the Guardian Corps were moving violently, but they were still maintaining some calm. Because of that, Gongson Chun Gi could watch this whole thing without feeling any caution. But even so, the difference of martial prowess between these people and his disciple was immense. Even then, the guardians of the garden couldn’t touch Cho Ryu Hyang. Gongson Chun Gi observed all this calmly, then suddenly flinched a bit. The formation was crumbling. A military formation was, in the end, a formation set up by people. If the individuals in the formation get shaken, the formation would break. 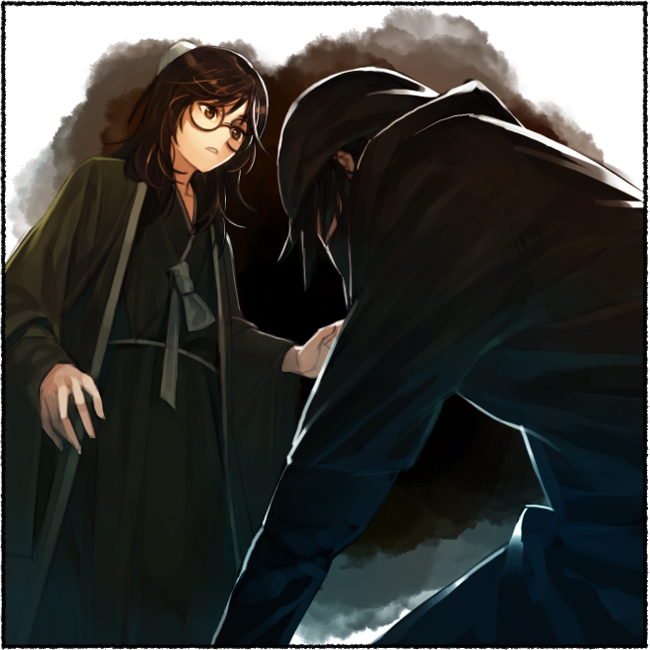 Cho Ryu Hyang knew that from the start, and proceeded to shake the individuals of the formation a bit by bit. And these little changes that Cho Ryu Hyang caused to the formation was clearly damaging the formation as a whole. Gongson Chun Gi looked at the Administrator with some interest. There was still a way to escape this, even at this point of time. But could that boy be able to notice that? While he had been wondering that in his head, the Administrator began to send out some commands to his subordinates. As expected of the Administrator. That fellow really couldn’t be underestimated. Gongson Chun Gi leaned forward, with a face full of excitement. How this event was caused in the first place no longer mattered. Just where would he be able to see something as entertaining as this? The feeling of worry he felt for his disciple disappeared in an instant, and that feeling was replaced by curiosity and excitement. He really did stumble on something good today. The shape of the formation changed abruptly, and Cho Ryu Hyang was suddenly facing a great danger. Could that boy, his disciple, overcome this danger? This new formation wasn’t something one could break just by knowing the path. While Gongson Chun Gi looked intently at the boy, Cho Ryu Hyang stopped moving and started to breathe deeply. Gongson Chun Gi’s eyebrows twitched. Just a moment ago, he felt the air itself tremble along with Cho Ryu Hyang’s breath. It happened in only an instant, but Gongson Chun Gi clearly felt Cho Ryu Hyang looking at him. Just what was that boy? Did he already possess some kind of strange skill inside his body at such an age? To think a skill that could fool even the eyes of Gongson Chun Gi could exist……. Gongson Chun Gi couldn’t even begin to fathom how deep and profound that skill could be. That skill that just managed to move the surrounding air for a moment. He didn’t know what it was, but that skill would soon be activated. It seemed some kind of a bet was held between the two or something, but he didn’t know about its details. Anyways, to Gongson Chun Gi, it seemed that Cho Ryu Hyang had won this battle. And that was exactly what happened. Cho Ryu Hyang instantly managed to suppress Un Hui’s subordinates, and escaped the formation. When Gongson Chun Gi saw this and nodded, he made eye contact with Cho Ryu Hyang once more. At the time Gongson Chun Gi was trying to say this with his eyes. The Administrator stared at Cho Ryu Hyang for a while, then fell down on his knees. When Gongson Chun Gi made a confused expression, Un Hui bowed his head down and spoke. Gongson Chun Gi’s jaw dropped. The Un Hui he knew was a really prideful fellow who wouldn’t dare bow down before someone else. Wasn’t that guy the one who had enough courage to try have a go at the Pope himself? Gongosn Chun Gi kept the guy around because of that, but just what was happening here? Gongson Chun Gi’s eyes began to be filled with complicated feelings. Wait so did the dragon deus ex machina do something or did the kid make a formation or something? find out next time on…. He used his power that freezes time. At least, I think that’s what it did. I’d have to reread the chapter where he helped the dragon. How did he get out of it? I don’t remember what happend before exactly. Oh woah—-! Loved this chapter! How awesome to see that cho ryu hyang managed to beat the administrator, while gongson chun gi was seeing it, too! The author chose some crazy order to get to the end of this little mini arc, but it was awesome anyway; thank you for the update. Yeay ! Thanks for the chapter ! after some extra long time we finally got a chapter……. as almost every chapter is a cliffhanger, it’s quite painful…. And the next chapter will probably be MC view…… plus will explain how it all happened….